Things not always run smoothly. It may happen, actually, that when an object slides on another, the advancement may occur through a 'stop and go' series in the characteristic manner which scientists call "stick-slip", a pervasive phenomenon at every scale, from earthquakes to daily-life objects, up to the "nano" dimension. Davide Mandelli, Andrea Vanossi and Erio Tosatti of the International School for Advanced Studies (SISSA) of Trieste have studied the conditions in which at the nanoscopic level the switch from smooth sliding to stick-slip regime occurs, simulating 'toy-like' systems of 'cold ions'. "Our studies are based on the research on trapped cold ions. Before we did, such methodology had never been applied to the field of friction", explains Tosatti. "These are experimental studies I call 'toy-like' because they are models employed to explore reality, in the same way as a Lego little house may be used as the model of a real house. We have simulated such systems and used them in our field of research." Tosatti is the coordinator of the research, which appeared in the scientific journal Physical Review. The study, besides SISSA, also involves the Centro Democritos of Officina dei Materiali CNR-IOM. 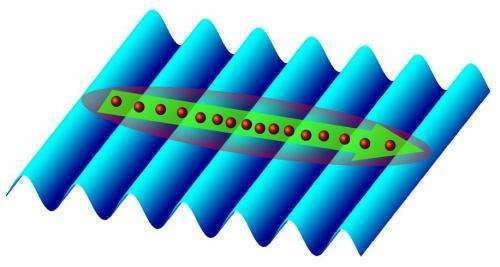 The three scientists have simulated the sliding of a one-dimensional ion chain of finite length on a substrate generated by laser beams (an optical lattice). "The lattice forms a periodic sequence of 'barriers' and 'holes', whose depth determines the behavior of the ion chain when advancing on the substrate pulled by an electric field," explains Mandelli, a student at SISSA. When the holes are shallow – technically speaking, when the amplitude of the corrugated potential is small enough – the ion chain can slide in a continuous manner, while when they are deeper the movement of the ions appears more restrained, and thus the stick-slip regime is observed." Another interesting observation" adds Mandelli "regards the role of the chain's inhomogeneity, as a consequence of which some areas get more or less stuck on the substrate. As a consequence, before the sliding process starts, internal 'adjustments' occur in which few ions move in the direction of the pulling force. Also this phenomenon has been observed at macroscopic scales." In a 2011 study Tosatti e Vanossi had already employed such model to study static friction. With this work they have extended their observations to the field of dynamics. "Such studies are important for two reasons", explains Mandelli. "On one side, the stick-slip is a complex phenomenon that occurs at every scale whose dynamics are still little-known. Just try to imagine how important it is to understand it from a geological viewpoint, for instance. On the other, with the development of nanotechnologies also from an application point of view it becomes fundamental to know the details of the interaction mechanics of molecules and atoms." On the connection between mesoscale and nanoscale friction Tosatti and Vanossi have recently published also a "colloquium" (a series of articles in scientific reviews) in the international journal Reviews of Modern Physics. Such research line carried out at SISSA has been recently awarded with a 5-year Advanced Grant by the European Research Council.